For more things to do, reviews, ratings, and more tourist information, read Miami trip maker . Stockholm, Sweden to Miami is an approximately 12.5-hour combination of flight and tram. You can also do a combination of flight and train. The time zone difference when traveling from Stockholm to Miami is minus 6 hours. Traveling from Stockholm in December, things will get much warmer in Miami: highs are around 32°C and lows about 23°C. You will leave for Orlando on the 3rd (Mon). Your day-by-day itinerary now includes Universal's Volcano Bay as well as Universal's Islands of Adventure. Kick off your visit on the 4th (Tue): cool off at Universal's Volcano Bay. 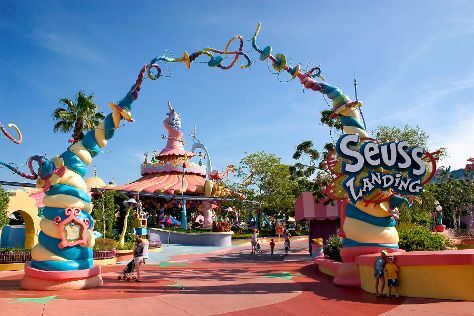 Here are some ideas for day two: get in on the family fun at Universal's Islands of Adventure. To see photos, more things to do, other places to visit, and more tourist information, refer to the Orlando tour website . Traveling by car from Miami to Orlando takes 4 hours. Alternatively, you can take a bus; or take a train. Traveling from Miami in December, Orlando is slightly colder at night with lows of 17°C. Finish up your sightseeing early on the 6th (Thu) so you can go by car to Marathon. Get ready for a full day of sightseeing on the next day: identify plant and animal life at Robinson Nature Preserve. To see traveler tips, where to stay, more things to do, and other tourist information, read our Tampa trip itinerary planner. Traveling by car from Orlando to Tampa takes 1.5 hours. Alternatively, you can take a bus; or take a train. In December, daytime highs in Tampa are 30°C, while nighttime lows are 19°C. On the 8th (Sat), you'll have the morning to explore before heading off to Miami. For other places to visit, more things to do, photos, and other tourist information, you can read our Miami online road trip planner . Traveling by combination of flight and tram from Tampa to Miami takes 4.5 hours. Alternatively, you can drive; or take a bus. Traveling from Tampa in December, Miami is somewhat warmer at night with lows of 23°C. You will leave for home on the 17th (Mon). Naples is a city in Collier County, Florida, United States. KoolCat Eco Tours has been added to your itinerary. Step off the beaten path and head to South Marco Beach and Bonita Springs Public Beach. Get in touch with nature at Ten Thousand Islands National Wildlife Refuge and Fakahatchee Strand Preserve State Park. When in Naples, make a side trip to see Big Cypress National Preserve in Ochopee, approximately 1h 25 min away. There's more to do: glide peacefully along the water with some of the best stand-up paddleboarding in the area. For more things to do, photos, traveler tips, and tourist information, read Naples vacation builder website . Traveling by car from Miami to Naples takes 2.5 hours. Alternatively, you can take a bus. Traveling from Miami in December, you can expect nighttime temperatures to be little chillier in Naples, with lows of 20°C. Wrap up your sightseeing by early afternoon on the 13th (Thu) to allow time for the car ride to Tampa. Discover out-of-the-way places like Florida Keys Wild Bird Rehabilitation Center and Parasailing & Paragliding. Take a break from the city and head to Spiegel Grove and Stand-Up Paddleboarding. There's lots more to do: get some thrills out on the water with a waterskiing or jet-skiing adventure, appreciate the history behind Christ of the Deep, stop by Sandal Kingdom, and get some fabulous bargains at Sandal Factory Outlet. To see where to stay, ratings, photos, and tourist information, use the Key Largo trip maker website . Traveling by car from Naples to Key Largo takes 3 hours. In December, daily temperatures in Key Largo can reach 30°C, while at night they dip to 22°C. Wrap up your sightseeing by early afternoon on the 16th (Sun) to allow enough time to drive to Miami. To find maps, other places to visit, ratings, and tourist information, refer to the Miami trip planner . Traveling by car from Key Largo to Miami takes 1.5 hours. Alternatively, you can do a combination of taxi and bus. You'll set off for home on the 17th (Mon).